A child who enters kindergarten with a strong vocabulary, a love of books, and a familiarity with playing with words, has a definite advantage. You can help those skills develop. Experts agree that talking, singing, reading, writing and playing with your young child will prepare them for learning how to read, and will teach them the six skills needed to read. The more you talk and read to your child, the more vocabulary they will learn, which is one of the six skills needed to learn to read. Talk, talk, talk with your young child, right from birth. Don’t be afraid to use unfamiliar words, but do be willing to explain what they mean. Make sure that you encourage your child to talk, and remember to listen. Choose books with unusual words because children hear three times more “rare” words in books than they will hear in conversation. Research has proven over and over that the single most important activity a parent can do with a child is read aloud. Snuggling with your child while reading a story helps brain development and bonding, and results in print motivation, the enjoyment of books. Reading aloud also helps your child with print awareness, the early literacy skill that means understanding how a book works, and that print is what we read. Read about things that fascinate your child, such as trucks or fairies or worms. This helps them increase their knowledge, as well as teach them that answers can be found in books. Attend story time at the library, where you’ll be introduced to the best books. Give books as gifts on special days. Read aloud for a total of at least 20 minutes every day, right from birth. Be sure your child sees you read what you like, too. Make sure books are in easy reach for your child. Use books to teach the alphabet, which is letter knowledge, another early literacy skill. Choose a letter of the day, such as B, and read about bears and bees. Read about bubbles while your child is in the bath, and a bedtime story at the end of the day. Rhyming helps children learn how to take words apart, and change their beginnings or endings to make new words. That’s part of phonological awareness, another skill needed to learn to read. Check out our favorite songs, rhymes, tickles and lap bounces. When you’re on a walk, choose a word and think of all the words you can that rhyme with it. They don’t have to make sense! Give everyone, including pets, a rhyming name for a day. Daddy Laddy, Bethany Pethany, Spot Dot. Read aloud books that have rhyming stories; just ask library staff for recommendations. Singing takes apart words into their smaller parts, which also helps children to understand later about the phonics of reading. Make up silly songs together. Sing while you’re bathing or diapering or feeding your child. Encourage sing alongs for the whole family. If you’re not comfortable singing, remember that the library has lots of CD’s to check out for free. Children need to use their imagination and creativity; that’s an important part of being a child. It helps them to use their vocabulary when they make up games and stories, and it teaches narrative skills, one of the early literacy skills needed to learn to read. Make up silly stories! Maybe it’ll be about a zebra with polka dots or a man who walks on his hands. Start reading aloud a book, but ask your child to make up the ending. At dinner, ask your child to tell everyone what they did that day, helping them to keep the events in order. Get down on the floor and pretend to be snakes, or act like monkeys in the backyard. Act out a familiar story with stuffed animals or puppets. Have a prop box with costumes, puppets, and toys for creative play. Reading and writing are both forms of communication. Encouraging your child to write, even if it’s scribbles, helps them learn print awareness, an understanding of the importance of print and an early literacy skill needed to learn to read. Make up your own version of a simple story with your child. Have the child draw the pictures and you write the words. Put it together and create a book, written and illustrated by the two of you! Encourage creative writing, with sidewalk chalk, washable markers, or crayons. If a child has a favorite subject, such as horses, help them learn to write words related to it, such as saddle, hoof, or cowgirl. Ask your child to print place cards or menus for special dinners. The following websites will help you learn more about early literacy, as well as find additional activities to do with your child. On the Ages and Stages page, you can click on the age of your child and it will give you information on topics such as nutrition, sleep, and growth development, as well as how to nurture your child with literacy activities. 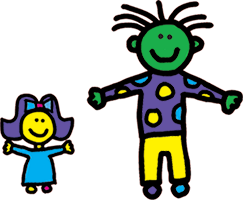 The section on Parent Resources provides printable brochures such as Getting Your Child Ready to Read, and Supporting Your Beginning Reader. The Early Literacy House is filled with ideas of activities you can do with your child, in every room of your house. This website provides information from pediatricians about the importance of reading aloud, and includes excellent charts of Developmental Milestones in several different languages. A free subscription will bring you access to videos and podcasts, booklists, tips on helping struggling readers, free reading guides, and topics from A to Z that offer help. Go to “Literacy Resources” and click on “Activities”, where you’ll find a printable monthly calendar with simple and inexpensive literacy-based activities between caregiver and child for each day. They also offer a multicultural booklist, and articles for parents about reading aloud. Click on “Literacy Resources,” and you’ll find free, reproducible activities for infants and preschoolers, in Spanish and English. Each activity is followed by tips for success and ways to make it more challenging. You’ll also find “on-the-go” activities for parents to do in the car, or on a walk, and those are translated into Spanish, Mandarin, Vietnamese, Somali, Russian, and Burmese. In the section “Behavior and Development” you will find the “Tips and Tools” about early language and literacy, including the Beginnings of Literacy, Learning to Write and Draw, Tips for Choosing Books, Songs, Rhymes and Fingerplays in Spanish and English, and information about how children learn multiple languages. Click on the following, and print out these simple flyers and charts that will help you help your child. Parents & caregivers of young children are invited to schedule "Read, Rhyme and Romp" workshops to learn about the role they have in preparing a child to learn how to read. The workshop provides parents & caregivers with ideas for fun activities with books, creative play, songs and rhymes, as well as an understanding of the stages of child development and the early literacy skills your child can start learning from birth. To schedule a workshop, contact Heather McNeil, Community Youth Services Manager at 541-617-7099, or heatherm@deschuteslibrary.org. Workshops can be scheduled at the library, or at another location for an existing group, such as a preschool, church, or parenting class. This Mother Goose rhyme is a great lap bounce. Just remember to always bounce or sway gently enough that it is never hurtful to the child. This is the way the ladies ride, Nimbledy-nim, nimbledy-nim, nimbledy nimbledy nimbledy-nim. This is the way the gentlemen ride. Gallop-a-trot, gallop-a-trot, gallop-a, gallop-a, gallop-a-trot. This is the way the farmers ride, Hobbledy-hoy, hobbledy-hoy, hobbledy, hobbledy, hobbledy-hoy! This rhyme and flannel board is perfect for teaching the beginning concepts of both addition and subtraction. 1 little cloud, sailing in the blue. Along comes another one, now there are 2. 2 clouds coming, now there's more. Help me count, 1, 2, 3, 4. 1 cloud floats away, happily. How many left? 1, 2, 3. Here come 3 to join the mix. How many now? 1-2-3-4-5-6. 5 float away, to visit the sun. Now all we have is little cloud ONE! This song is great to use at the beginning of a storytime, or before each story, so the children know it's time to listen. My ears are ready to hear. My eyes are ready to see. My hands will clap, Then in my lap. It's storytime for me. This song invites participation from your child(ren) by asking them for ideas on what Aiken Drum looks like. It's a great vocabulary builder. There was a man lived on the moon, on the moon, on the moon. There was a man lived on the moon and his name was Aiken Drum. And he played upon the ladle, the ladle, the ladle, He played upon the ladle, and his name was Aiken Drum. (ask child(ren) for ideas of kinds of food, or animal parts, or transportation parts, and add them in to the song as part of Aiken Drum) His nose was made of a peach....and his name was Aiken Drum. His eyes were made of headlights...and his name was Aiken Drum. His ears were made of elephant ears...and his name was Aiken Drum. This song is great to use at the beginning of a storytime, to get the children excited about storytime and ready to listen. Storytime Is Here Tune: There Ain't No Bugs On Me Storytime is here. Give a great big cheer! Songs and rhymes, a real good time. Storytime is here. Storytime is here. Give a great big cheer! Lots of fun, for everyone. Storytime is here. Storytime is here. Give a great big cheer! Bend your knees, give yourself a squeeze. Storytime is here. Storytime is here. Give a great big cheer! Turn around, sit on the ground. Storytime is here. Storytime is here. Give a great big cheer! Quietly, listen and see. Storytime is here. This is a rhyming game to use as a "filler" at storytime. You can fill your bag with whatever fits the theme, and pull them out periodically during storytime. Here's my bag with something inside. What could it be? I'll pull it out so you can look. Tell me what you see. This is a popular song about a dog, with simple actions for young children to follow. I have a dog and his name is Rags. He eats so much that his tummy sags. His ears flip flop and his tale wig wags. And when he walks he goes zig zag. He goes flip flop, wig wag, zig zag, He goes flip flop, wig wag, zig zag, He goes flip flop, wig wag, zig zag. I love Rags, and he loves me. Woof! This is a song to the tune of Mary Had a Little Lamb. Insert different colors, or pieces of clothing to help children practice their vocabulary. It also gets kids moving, which helps them retain attention for longer stories to follow. If you're wearing blue today, blue today, blue today, If you're wearing blue today, please stand up! If you're wearing pants today, pants today, pants today, If you're wearing pants today, please stand up! Follow the actions described by the words. This is a simple stretch that can be inserted anywhere if you notice your audience is getting restless, or to bring a group's attention back to you in a transition. Reach up high, Bend down low. Touch your knees, And sit down slow. This is a silly version of a traditional folk song. When you hear a word that starts with the letter "b" or "buh" sound, stand up if you're sitting, or sit down if you're standing. Listening for a specific sound helps kids identify letters, and lays the foundation for spelling and reading. It also gets kids moving, which helps them retain attention for longer stories to follow. I rarely get it right, but that makes it all the more fun! My Bonnie lies over the ocean, My Bonnie lies over the sea, My Bonnie lies over the ocean, O bring back my Bonnie to me. Chorus: Bring back, bring back, O bring back my Bonnie to me, to me: Bring back, bring back, O bring back my Bonnie to me. This is a fun and silly song I remember from my campfire days. Practicing following directions helps kids get ready for the structure of preschool and kindergarten classes, so pairing movements with words will in the order described will help them get ready to learn. I'm a little hunk of tin. No one knows the shape I'm in. Got four wheels and a running board, I'm a four-door, I'm a Ford. Chorus: Honk-honk, rattle, rattle, rattle, Crash, beep, beep. Honk-honk, rattle, rattle, rattle, Crash, beep, beep. Honk-honk, rattle, rattle, rattle, Crash, beep, beep. Honk-honk, honk-honk, honk-honk. Actions: Honk-honk: Pull both ears once for each "honk" Rattle, rattle, rattle: Shake head back and forth for each "rattle" Crash: Gently hit chin with palm of hand Beep, beep: Gently push nose like a button for each "beep"
This song is wonderful to use everywhere! You can be sitting, standing, dancing, and playing. You can use your ten little fingers with tickles and so much more. For example: frogs! 1, 2, 3, little frogs(add other animals). One little, 2 little, 3 little tickles. 4 little, 5 little, 6 little tickles. 7 little, 8 little, 9 little tickles. 10 little tickles everywhere! An action rhyme using your hands as apples along with felt apples. It's fun to use different colored apples. Lyrics: Way up high in the apple tree, two RED apples smiled at me I shook that tree as hard as I could. Down came the apples ...mmmm good. A big bag filled with fun stuff to pull out. Kids can guess what you have in the bag. You can also go different places in town, and go there by swimming, running, jumping etc. Lyrics: Walking to the Library what do you see? Do you hear a noise, what could it be? Finger and counting rhyme, I like to use felt cookies. If you have a small group you can use the child's name plus add more cookies, or if a big group just use little girl or boy. Lyrics: 5 little cookies in a bakery shop Shining so bright with sugar on top Along came (insert child name or a little girl) with a quarter to pay She bought that cookie and took it away. Description: Song adding color and counting. Use different color felt fish and have the children shout out the color. Lyrics: There are so many fishes(fishies) in the deep blue sea, what color fish do you see? BLUE blue this fish is blue, this little fishy is blue. (repeat until all colored fish out.) Last line: There are so many fishes in the deep blue sea won't you please count them with me. Description: Transportation theme, use different felt vehicles have the children shout them out and do actions and sounds of different vehicles. Lyrics: I went walking down by the bay, I saw a CAR along the way I waved at the driver and he waved at me and the car went beep beep beep.. This song is fun to use with just about every animal. It's also fun to use food items such as a pumpkin! With "I'm a Little Fishy," you can be standing up or sitting down, using your hands or using a puppet. I'm a little fishy, I can swim. Here is my tail and here is my fins. When I want to have fun with my friends, I wiggle my tail and dive right in. One of my all-time favorite storytime songs! A fun way to learn different parts of the body. Lyrics: Put your finger on your belly, on your belly, (suit actions to words) Put your finger on your belly, on your belly. Put your finger on your belly and wiggle it around like jelly, Put your finger on your belly, on your belly! Put your finger in the air, in the air, Put your finger in the air, in the air. Put your finger in the air and wave it around while you're there, Put your finger in the air, in the air! Put your finger on your nose, on your nose, Put your finger on your nose, on your nose. Put your finger on your nose and run it right down to your toes, Put your finger on your nose, on your nose! Put your finger on your toe, on your toe, Put your finger on your toe, on your toe. Put your finger on your toe and move them to and fro, Put your finger on your toe, on your toe! Put your finger on your ear, on your ear, Put your finger on your ear, on your ear. Put your finger on your ear and see if it's still here, Put your finger on your ear, on your ear! "La araña pequeñita" es una canción popular que a la vez es un juego de dedos. ¡Preparen sus dedos! Lírica: La araña pequeñita subió, subió, subió. Vino la lluvia y se la llevo. Salió el sol y todo se seco. ¡Y la araña pequeñita subió, subió, subió! Úsenla también para enseñar lo opuesto de la palabra "pequeñita." La araña grandotota subió, subió, subió. Vino la lluvia y se la llevo. Salió el sol y todo se seco. ¡Y la araña grandotota subió, subió, subió!